James B Yoseph and Hannah Yoseph, M.D. 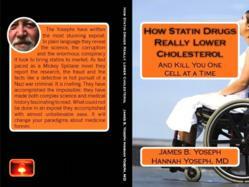 Announce Their New Book "How Statin Drugs Really Lower Cholesterol (And Kill You One Cell At A Time)"
Order today: https://www.createspace.com/3829525 Your discount code: az33n949 Enter it on the Checkout Page. Statin Drugs are mycotoxins. "How Statin Drugs Really Lower Cholesterol (And Kill You One Cell At A Time)" makes the case that Statin Drugs kill everyone who takes them by blocking the Mevalonate Pathway (they are HMG-CoA reductase "inhibitors") — Even those who have no apparent symptoms are slowly dying because cell replication is stopped by Statin Drugs. The Statin Drugs industry is huge. 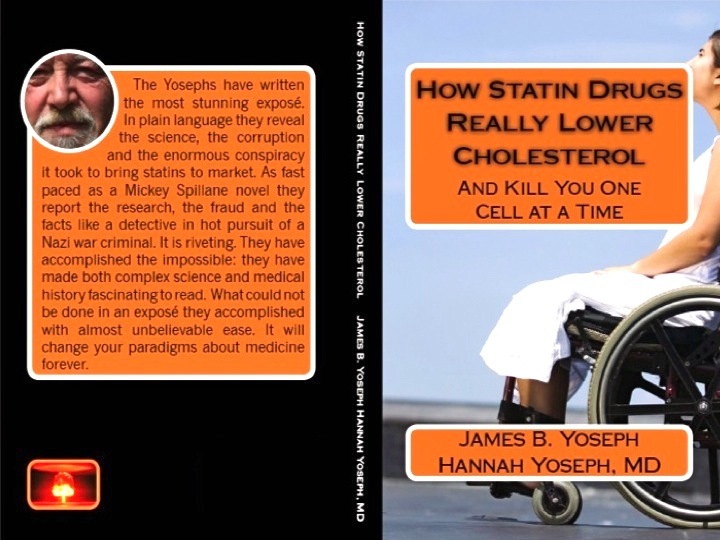 Evans Consulting Services (Saskatchewan) announced today that it has entered into an agreement with James B. Yoseph and Hannah Yoseph, M.D., (Florida), to market their new book "How Statin Drugs Really Lower Cholesterol (And Kill You One Cell At A Time)". Morley Evans of Evans Consulting Services (Regina) says, "The Yoseph's new book takes a fresh look at the issue of cholesterol and Statins that are prescribed to lower cholesterol." "How Statin Drugs Really Lower Cholesterol" goes to the heart of the matter. Statins are mycotoxins. Statins are derived from fungal poisons. Statins are fungal poisons. Statin Drugs are wildly popular with doctors. Hundreds of millions of prescriptions for Statins such as Lovastatin (Mevacor™ from Merck), Simvastatin (Zocor™ from Merck), Atvorastatin (Lipitor™ from Pfizer) and Cervistatin (Baycol™ from Bayer) have been written. The pharmaceutical industry (doctors, pharmacies and pharmaceutical companies) is huge and Statin Drugs are the most profitable prescription drugs in history. Pharmaceutical company revenues from Statins far exceed revenues from other pharmaceutical drugs. Statins have been embroiled in controversy since Merck introduced Lovastatin twenty years ago. Baycol™ was withdrawn from the market after people started dying — litigation is still before the courts years later. Since the patent expired on Zocor™, Merck has introduced it in the United Kingdom as an over-the-counter drug to be marketed there by Johnson & Johnson. Rosuvastatin (Crestor™ from AstraZeneca) has been introduced in India, which is a billion-person market. The need to lower cholesterol to prevent heart disease has always been disputed by doctors and scientists. "How Statin Drugs Really Lower Cholesterol" reveals that hundreds of millions of people have been deliberately poisoned. Every one of them has been harmed, regardless of symptoms they may have had or not had. "How Statin Drugs Really Lower Cholesterol" is not empty opinion. The Yosephs have worked for years to collect a detailed history of Statins beginning with Triparanol (MER-29™ from Merrell Pharmaceuticals) that was wildly popular with doctors in the 1950s. The book is packed with evidence. Not incidentally, Merrell Pharmaceuticals introduced a sedative in the 1950s that was wildly popular with doctors. It was called Thalidomide. The Yosephs document how Merck and people inside Merck, the FDA, and the NIH, exposed MER-29 as a dangerous drug that caused cataracts and blindness. Forty years after they had MER-29 removed from the market, the same people reintroduced their own Statin Drug to poison hundreds of millions of people and make billions of dollars for pharmaceutical companies. "How Statin Drugs Really Lower Cholesterol" may change the way people think about pharmaceutical medicine itself. SUE! Statins! is dedicated to your good health. SUE! Statins! has been established to expose Statin Drugs as a public health menace. Medicine must be returned to serving those who are ill and suffering. SUE! Statins! Is dedicated to your good health.